HIROSE Electric Co. Ltd., Tokyo, and the HARTING Technology Group have entered into an agreement to jointly develop, standardise products and market a connection technology system for Single Pair Ethernet (SPE). “The joint development in the area of Single Pair Ethernet continues and consolidates the successful technology partnership of both companies,” says HIROSE President Kazunori Ishii. The duo’s partnership was announced in the autumn of 2016 when HIROSE and HARTING jointly launched the ix Industrial® interface on the market. “The ix Industrial® mating face has notched up great success in the interim and is a popular interface for numerous users in their miniaturised applications for four-pair Ethernet,” underlines HARTING CEO Philip Harting. In order to make the new connection technology for Single Pair Ethernet a success, the technology partnership between Ostwestfalen-Lippe and Tokyo is pursuing the systematic expansion of the entire technology to achieve an end-to-end, complete infrastructure. The latter consists of offering a practicable portfolio of connectors, sockets, cables and cable sets on the component side. On the other hand, both partner companies are endeavouring to successfully position the entire technology in user groups. “In addition to establishing a uniform mating face, the standardisation of all other aspects is actively being pursued and is seen as the basis for a comprehensive SPE ecosystem,” says Ralf Klein, Managing Director HARTING Electronics. 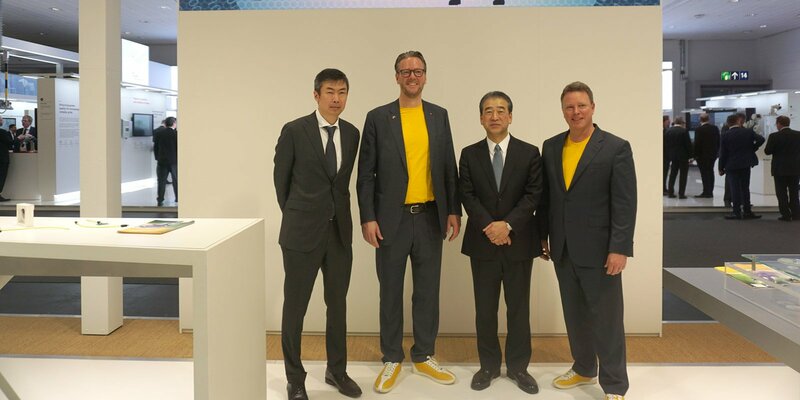 Reaffirmed their cooperation at HANNOVER MESSE: Hiroshi Satoh, Division General Manager, International Business Division, HIROSE; Philip Harting, CEO HARTING Technology Group; Kazunori Ishii, President HIROSE; and Ralf Klein, Managing Director, HARTING Electronics (from left to right). HARTING and HIROSE therefore keep a close eye on standards for single-pair cabling and the components required on the device side, as well as the necessary transmission standards such as IEEE802.3 BASE-T1. A complete infrastructure for IIoT based on Ethernet can be created with the help of this solid base. The goal of this proven alliance of the two technology partners is a consistent and reliable Single Pair Ethernet infrastructure that brings the IIoT to life. Whether in transportation, robotics, energy or classical industrial automation, T1 Industrial from HIROSE and HARTING gives users a comprehensive infrastructure to take a successful step on the way to the Internet of Things. Are you interested in Single Pair Ethernet? Then get to know our Tw1ster!